The passenger car ferry Express Skiathos was built in 1996 in Greece and is the smallest conventional ferry operated by Hellenic Seaways. Express Skiathos has a passenger capacity of 1390 passengers and can carry up to 184 cars in its garages. 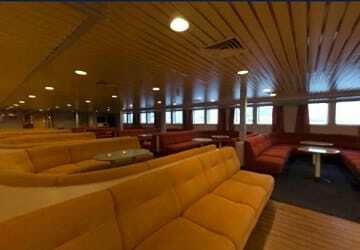 The ship has four outer decks which can be accessed by passengers wishing to take in a different view whilst travelling, on decks 1 and 2 there is plenty of outer seating available. There are no cabins on board however seating is available to book in three different lounges, Economy class 1, Economy class 2 or A class. 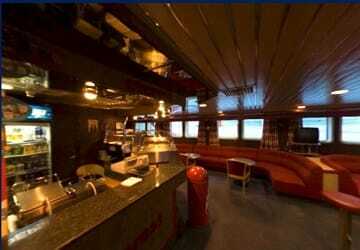 All lounges are equipped with a bar area to purchase refreshments from. Please Note: Whilst we have taken great care in making our Express Skiathos guide as accurate as possible, onboard facilities, services and entertainment may vary depending on the date and time of year that you travel, facilities mentioned may change without notification and ferry companies reserve the right to operate vessels other than those mentioned at time of booking without prior notification. "Trouble free 5 star Experience"
Fantastic prompt and reliable service. 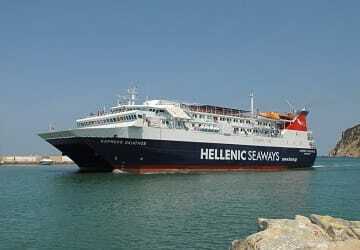 Easy booked on line and excellent communication throughout Will definately use again..
outward with the regular ferry from Skopelos to Alonissos, The Skiathos Express. Very neat and clean. Luggage could be left on the car deck so you do not have to climb with heavy suitcases. The boat arrived fifteen minutes late, but that was not a problem. It was a very nice trip on a calm sea. For the return journey, I, due to unforseen circumstances, changed the departure and travelled on board the direct Flying Cat 5 from Alonissos to Skiathos. It was an exciting experience. 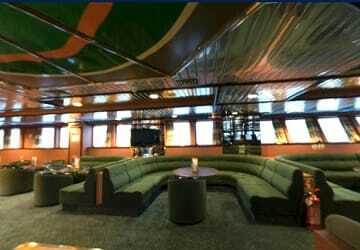 The ship was very neat, on time and well organised. Fixed seats. just like in an airplane. Only, a part of the journey (from Skopelos to Glossa) got really, really wild. You could not walk around without wobbling too much. We were immediately handed plastic bags by stewards. Very thoughtful. And all in all a very good, quick trip. "Efficient service and nice staff"
Perfect! Punctual, kind staff, efficient website! I recommend it! Great smooth trip via Alonysos, perfect end to our journey and on the return one of the staff members found my wifes sunglasses. Office staff in the booking office on Skopelos and Skiathos were very helpful and could speak excellent English. Will use next year for sure! Ferry arrived promptly, lovely way to travel, staff helpful, so easy to prebook tickets would definitely recommend. The ship is lovely, it was such a fantastic day though that I can't comment on the facilities I spent the whole evening sitting out on the open deck, wind in my hair and having a wonderful time admiring the beauty of the route. My one tip for users would be that your e-mail is not your ticket - you have to exchange it at the office which is in a shop on the street opposite the port. This is not obvious, if like us you arrive on foot from the bus station side of Volos. Therefore having got on board and up the stairs I had to go back and exchange the e-mail for tickets - luckily we arrived with plenty of time so it was not an issue for us. We travelled on the 16/08 from Skopelos to Skiathos. When you board the ferry the staff ask you to put all your luggages in a specific area. Someone stole our bags because no-one is controlling the area. The quickly and conveniently. The stops were a few minutes which helped even arrived ahead of schedule.